Thinly sliced gold potatoes tossed in garlic, butter, and thyme then roasted to perfection. An easy 5-ingredient side dish for any occasion! Preheat oven to 375 degrees F. Coat the bottom of a cast iron pan or large skillet with 2 tablespoons of melted butter. Set aside. 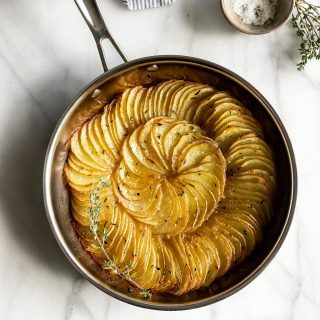 Arrange the potato slices vertically at a angle in the pan, filling the pan completely without crowding it. Make sure there's space in between each slice so it cooks evenly. In a small bowl, mix remaining melted butter (6 tablespoons) with minced garlic, fresh thyme and salt. Pour the butter mixture on top, making sure each slice is evenly coated. Place skillet in the oven and roast potatoes for 1 hour until the top edges of the potatoes are crispy. Remove from oven and cool for 10 minutes before serving. Enjoy!